The wedding of HRH Prince Carl Philip and Miss Sofia Hellqvist took place in the Royal Chapel at the Royal Palace of Stockholm on Saturday 13 June 2015 at 4.30pm (Swedish Royal Court website here). 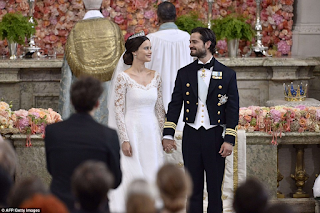 The ceremony was conducted by Royal Court Chief Chaplain, the Rt. Rev. 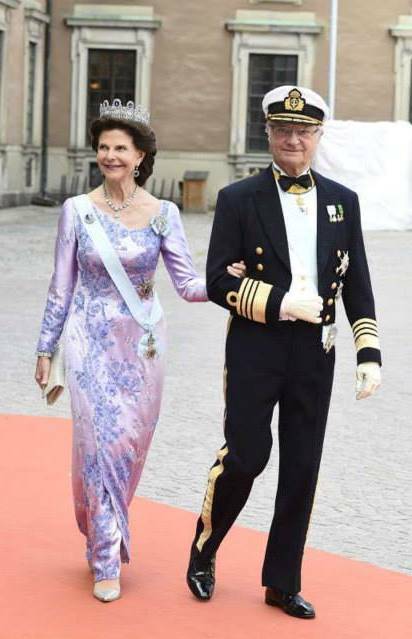 Lars-Göran Lönnermark, assisted by Royal Court Chaplain, the Rev. Michael Bjerkhagen. 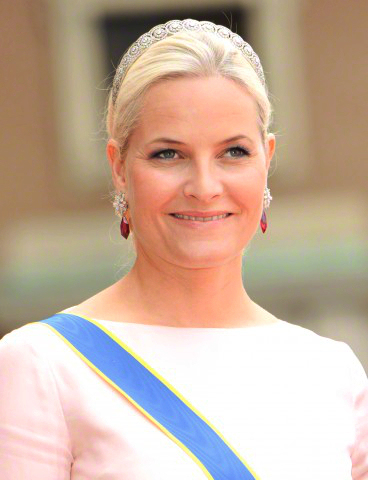 Queen Mathilde of Belgium, wearing the Nine Provinces tiara in its smaller form (more on the tiara in my previous blog post here) and Queen Fabiola's Fringe brooch. 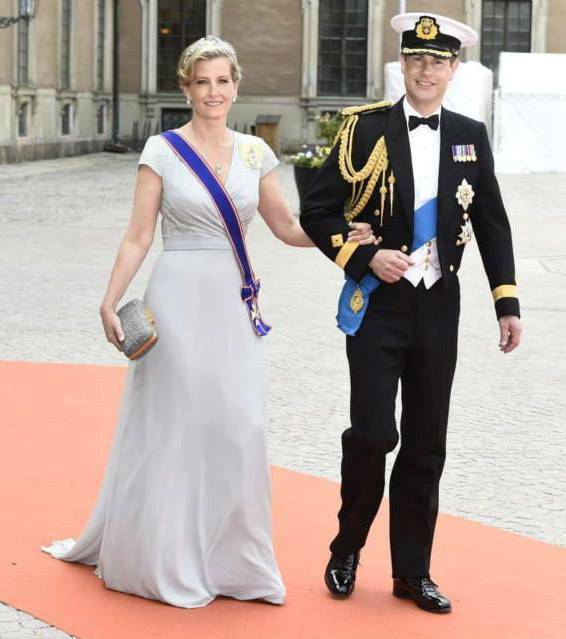 Queen Maxima of the Netherlands, in a Jan Taminiau gown first seen at King Willem-Alexander's inaugural dinner in 2013 and the Mellerio Ruby parure. 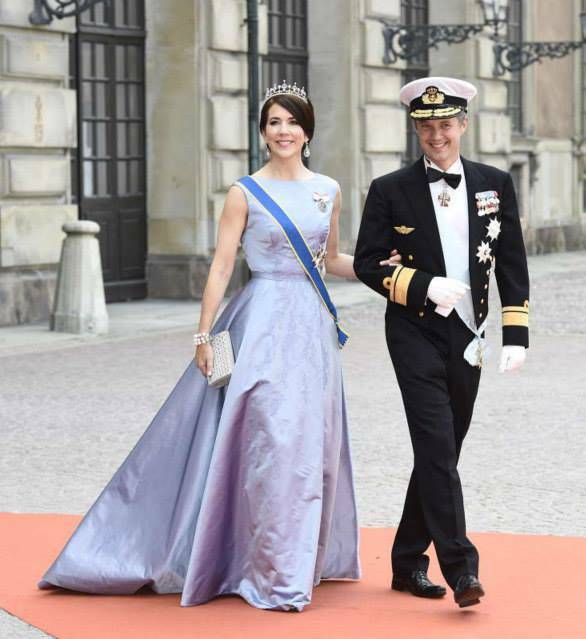 Crown Princess Mary, in her wedding tiara and earrings, and Crown Prince Frederik of Denmark. 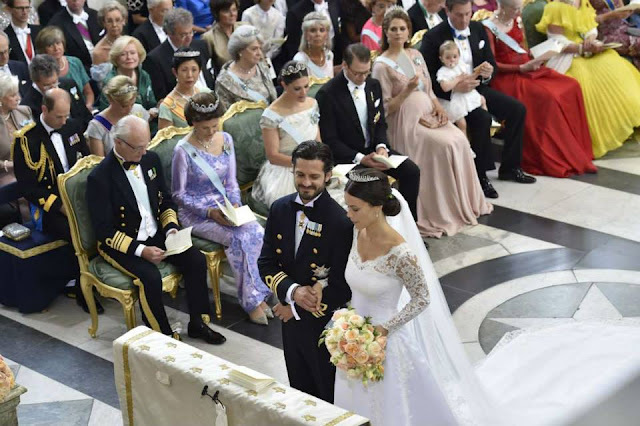 Princess Marie, in an Alberta Ferretti gown her wedding tiara, and Prince Joachim of Denmark. 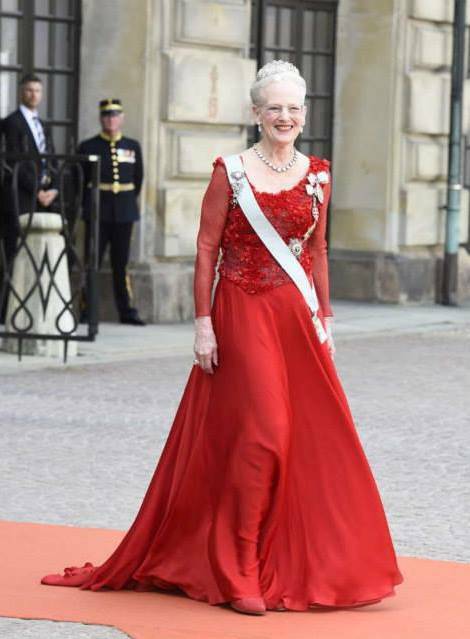 Queen Margrethe of Denmark, in the same red gown she wore for her 75th birthday celebrations in April 2015 and the Baden Palmette tiara. 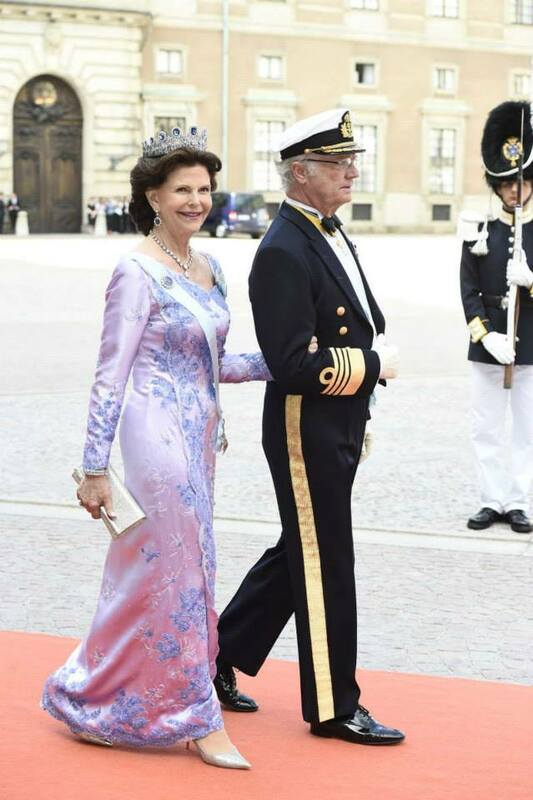 The Earl and Countess of Wessex. 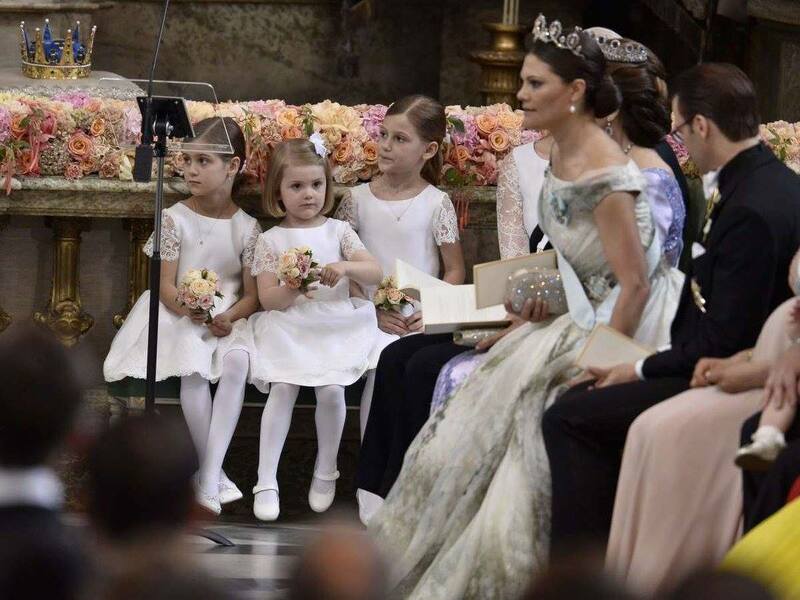 Sophie wears her aquamarine and diamond tiara and a gown by Czech deisgnerTaťána Kovaříková (info via My Small Obsessions on Facebook). 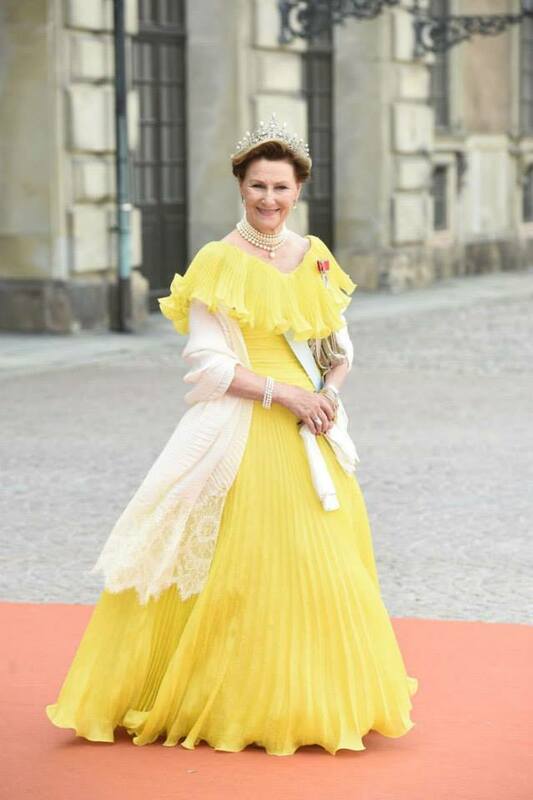 Queen Sonja of Norway in her trademark yellow gown and Queen Maud's pearl and diamond tiara. 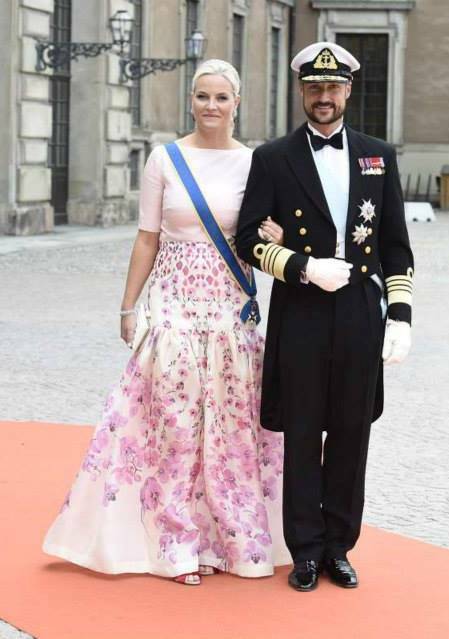 Crown Prince Haakon and Crown Princess Mette-Marit of Norway, in a Temperley London skirt, Nina Skarra top, the Diamond Daisy tiara and the most gorgeous diamond and rubellite (a coloured gemstone from the family of the tourmalines) earrings. 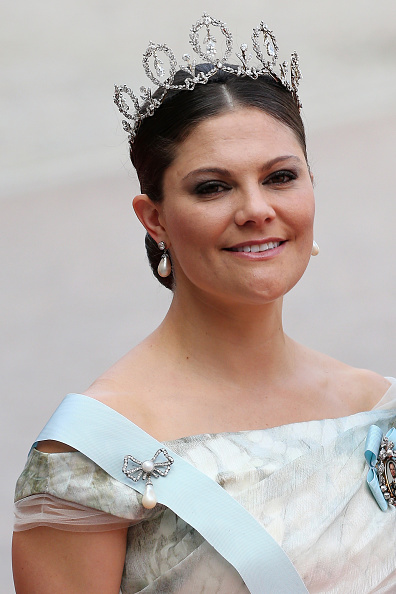 Princess Märtha Louise of Norway and Ari Behn. 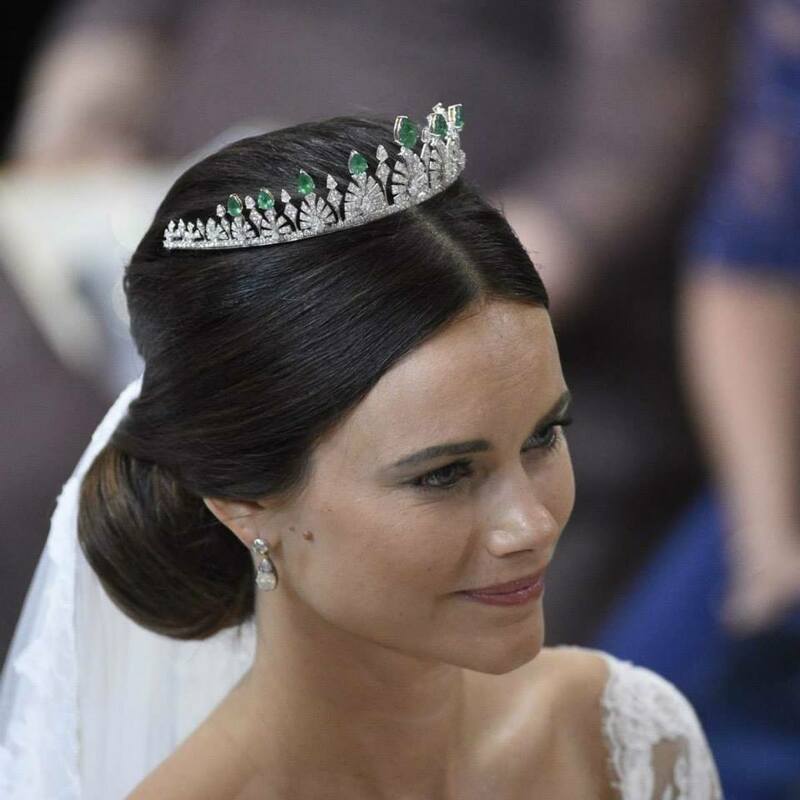 The Princess wore the King Olav Gift tiara, a diamond necklace and new green peridot, purple amethyst and white gold with pavé diamonds earrings, both by Norwegian company HiD Jewellery. 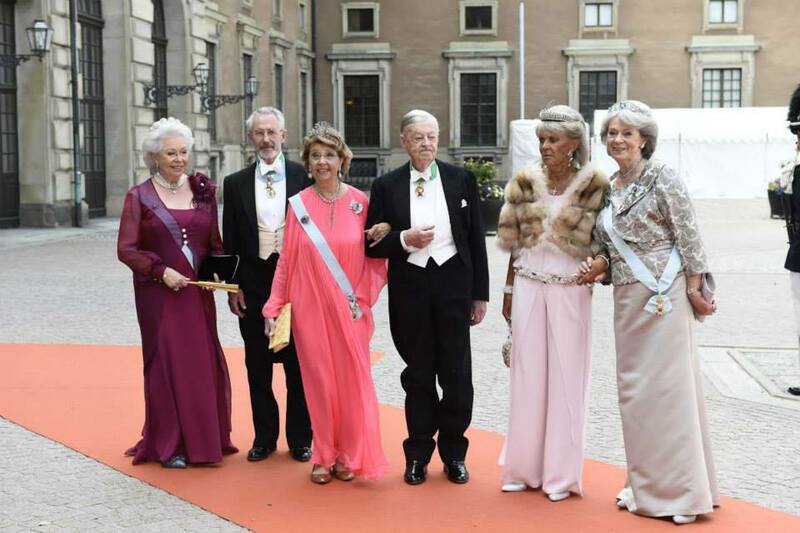 King Carl XVI Gustaf's sisters, l-r: Princess Christna, Mrs. Magnuson (wearing the Six Button tiara) with her husband, Princess Desirée, Baroness Silfverschiöld (wearing the Napoleonic Cut-Steel tiara), with her husband, Princess Birgitta (in the Baden Fringe tiara) and Princess Margaretha, Mrs. Ambler (in the Aquamarine Kokoshnik tiara). 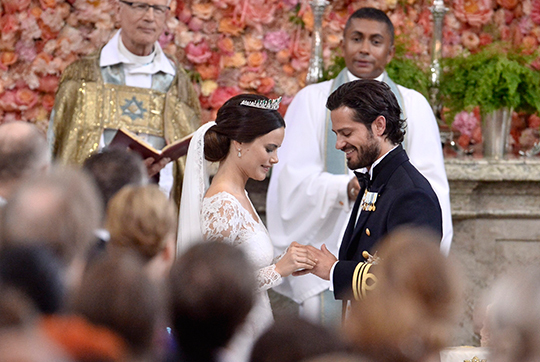 The groom's parents, the King and Queen of Sweden. 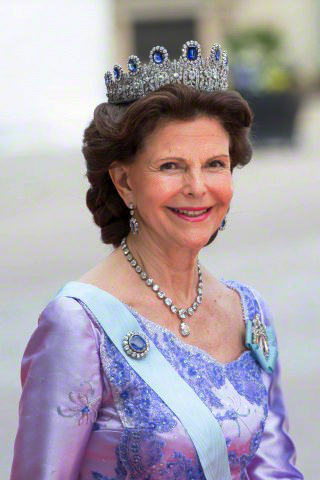 Queen Sylvia wore the Leuchtenberg Sapphire tiara, earrings and brooch and a diamond collet necklace. 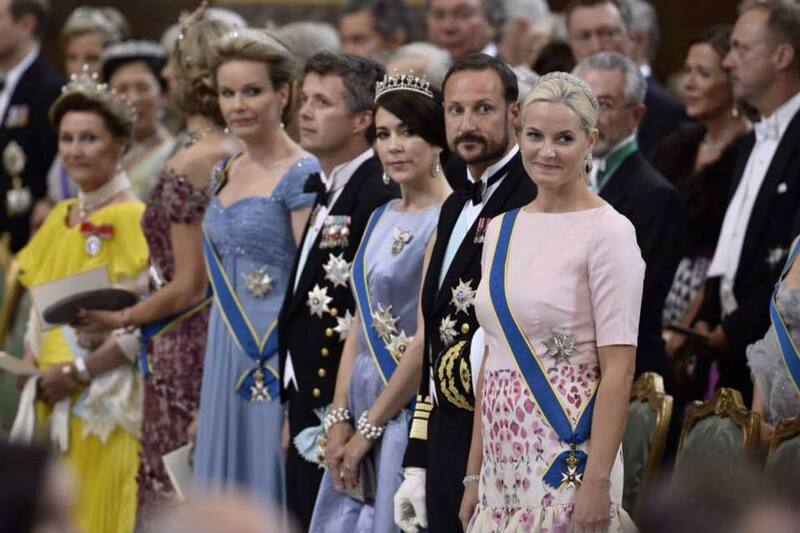 The King was in the uniform of an Admiral of the Fleet. 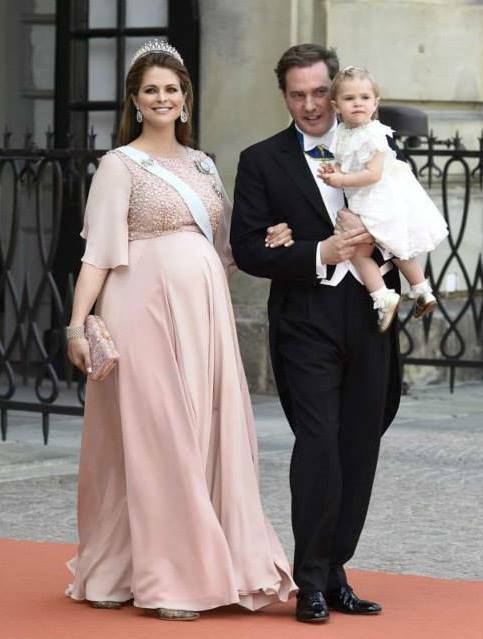 Princess Madeleine, who gave birth to her second child only two days after the wedding, in an Elie Saab gown, the Modern Fringe tiara and the Vasa earrings, with husband Chris O'Neill and daughter Leonore, in an antique dress once worn by her great-great-grandfather King Gustaf VI Adolf in 1884 and a white hair bow by Swedish children's clothing company Livly. 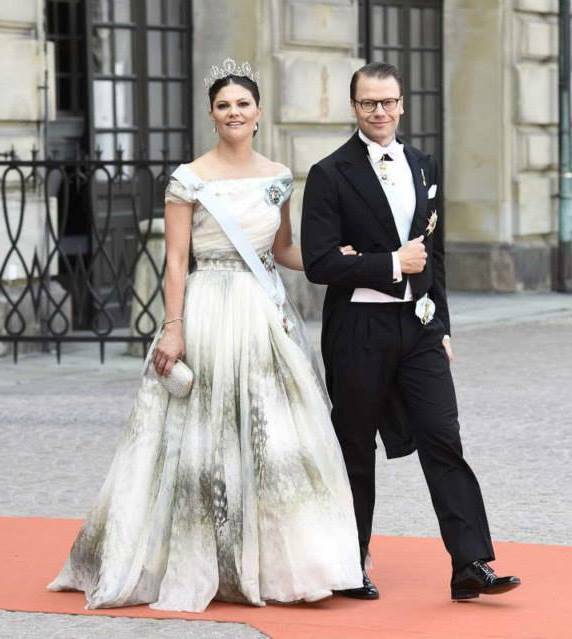 Crown Princess Victoria, in a bespoke H&M Conscious gown and the Connaught tiara, with husband Crown Prince Daniel. 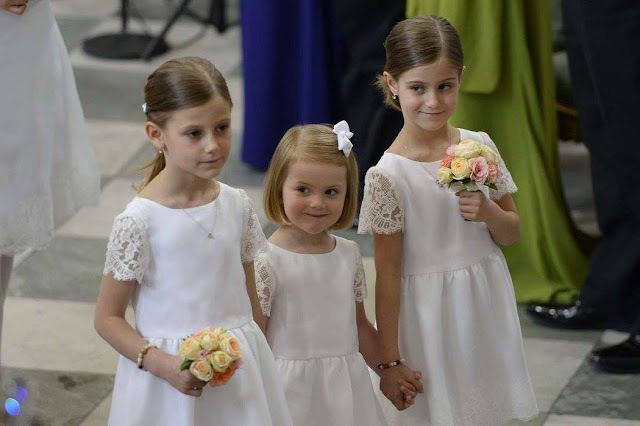 The bride's wedding dress, in three shades of white, was created by the Swedish designer Ida Sjöstedt. 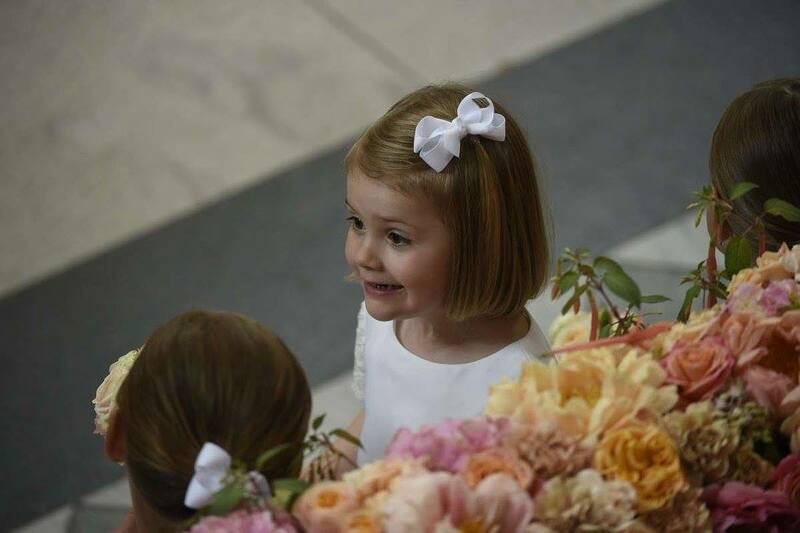 The dress is made from silk crepe overlaid with Italian silk organza. 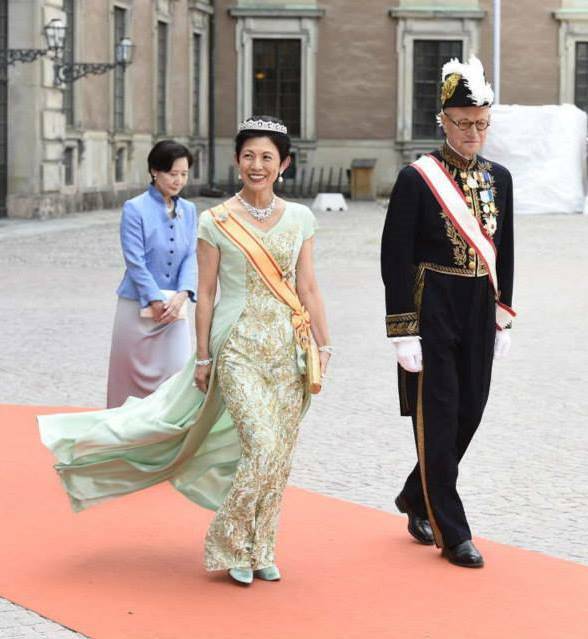 Couture lace made by José María Ruiz was applied to the dress and the train was hand-cut and then hand-stitched in Ida Sjöstedt's atelier in Stockholm. 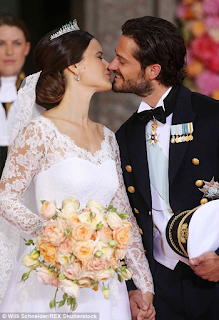 The veil in thin bridal tulle was also hand-embroidered with sheer cotton lace. The bride's hair and make-up were by Marwan Hitti and William Värnild. 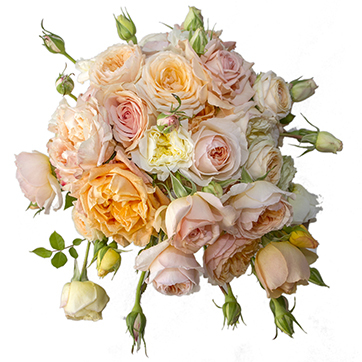 The bride carried a cascade style bouquet of garden roses with a traditional sprig of myrtle from Sofiero. The flowers were in shades of cream and coral. 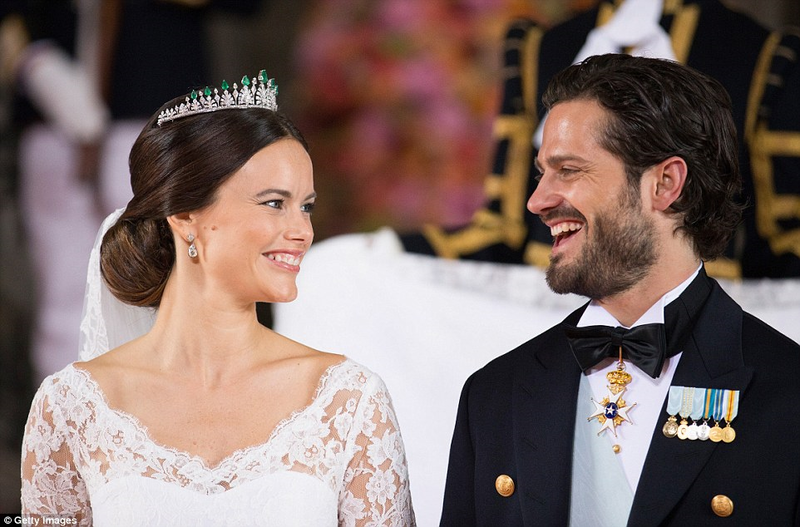 Prince Carl Philip is a major in the Swedish Amphibious Corps, and wore mess dress model 1878. The Prince wore the light blue sash of the Order of the Seraphim, together with the Star of the Order, as well as the Order of the Polar Star cross, on a black band around his neck.